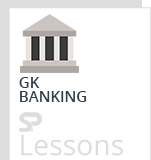 Banking Awareness Quiz 9 – Practice Sets article provides the list of several bank related questions to prepare aspirants of different competitive exams in India, primarily for banking related employment. The article Banking Awareness Quiz 9 – Practice Sets is very useful for different exams such as IBPS PO, Clerk, SSC CGL, SBI PO, NIACL Assistant, NICL AO, IBPS RRB, Railways, Civil Services etc. 1. Which among the following is also known as Pacific Rim trade IBSA ? 2. Which one of the following will setup core banking infrastructure for rural banks ? 3. Who is the Ex-Officio chairmain of Niti Aayog ? 4. Which of the following is correct regarding the Gross Domestic Saving in India ? 6. Who is the Chairman of ISRO at present? 7. What do you understand by “Para Banking” services ? 8. In the context with Investment what are A, AA+ and AAA ? 10. A significant decrease in the demand for loans will force Banks to _________. 2. Which of the following is not a function of commercial banks ? 3. Which of the following is generally referred to as a ‘Broader’ measures of money supply ? 5. A Maharatna company can invest which of of the following amounts independently for a project ? 7. Which of the following scheme is related with Financial Inclusion_ ? 8. With reference to Banking what is PCR ? 9. Goods and Services Tax (GST), would replace which of the following tax/taxes ? 1. Kisan Credit Card Scheme (KCC) was introduced in 1998-99 to improve the credit delivery to farmers. Which one of the following does not operate this scheme ? 2. Which one of the following is a source of non-tax revenue for Government of India ? 3. Many a times we read in newspapers a term CBS. What does B denotes in the term ‘CBS’ ? 7. Co-operative movement in which of the following section of the indian economy has been highly successful ? 9. Which of the following agencies was set up to promote new technological inputs in rural sector ? 10. What are the objective taken by NABARD to improve the Rural Banking infrastructure ? 1 .”Open Market Operation” are controlled by —–. 2. Which are following statement(s) is/are correct definition of ‘payment balance’ in economy terms? (B)This is a transaction record between specific country and all countries. 3. RBI has permitted non banking finance companies (NBFCs) to enter the _____ business through the joint venture route. 4. Which of the following is not a part of the World Bank? 5. Which of the following statements is/are true about the shareholding in the Regional Rural Bank (RRB)? A. Central govt. holds 50% stake. B. RBI holds 50% stake. C. State government holds 15% stake. D. Sponsored bank holds 35% stake. 7. Which of the following is called “paper gold” ? 8. Which of the following is/was Not included in the agenda set for the Banking Reforms in India ? 9. In respect of which one of the following areas, Y. H. Malegam Committee has submitted its recommendations? B. Price decline in specific sectors. C. Price decline in specific commodities. D. Sharp and sudden decline in foreign exchange reserves. 2. Which of the following agencies/organizations in India maintains the Micro Finance Development and equity fund? A. Confederation of Industries in India. 4. Which of the following terms is not used in Economics? 5. The Reserve Bank of India is regularly revising upwards the repo and reverse repo rates. Why is this being resorted to? C. To encourage rise in interest rates on deposits. A. Those borrowers who do not have a good credit history. B. Those who wish to take loan against the mortgage of tangible assets. C. Those who have a good credit history and are known to bank since 10 years. D. Those borrowers who are most preferred customers of the bank. 7. Expand the term ALM as used in Banking/Finance sector ? 8. Basel – II norms are associated with which of the following aspects of the banking industry? 1. Which statement is correct for the Planning Commission of India? C. Its members do not require any minimum qualification. 2. As per the new guidelines issued by RBI, the minimum required capital to set up a bank by corporate is set at ________. 3. The economy of India is/are facing which of the following problem/problems now a days? B. Disequilibrium in balance of payments. C. High inflation and high food and commodity prices. 4. The primary monetary policy technique employed by the Reserve Bank of India is ________. 5. When a bank writes off a loan as bad, its ________. A. Total assets and total liabilities decreases by that amount. B. Total liabilities and capital decreases by that amount. C. Total assets and capital decreases by that amount. D. Total assets, total liabilities and capital decreases by the amount. 6. Which of the following organisations maintains CRR ? 7. Many a times we read in financial newspapers about channel financing. ‘Channel Financing’ is/are associated with ________. 8. Invisible export means export of ________. 9. Which of the following is not the part of prudential guidelines issued by Reserve Bank of India? C. Instruction to a banker to collect a customer’s debt. 2. Which is not an example of near money? 4. Which of the following is not a function of the commercial Bank ? A. Acting as a lender of last resort. 6. Which of the following banks were merged into to form Imperial Bank of India ? 7. Which bank launched India’s first loan disbursement card? 8. For which of the following banks, did RBI introduce the scheme ‘protected disclosure’? 9.’The Decade of Action for Road safety’ campaign by ___________ was launched in India recently. 10. What is the current duration of New Foreign Trade Policy? 5. BASEL – III will be implemented from _____. 6. Which of the following in not included in M2? 8. In which year did the United Nations General Assembly adopted the World Environment Day? (C) Whose more than 51% equity capital is owned by foreigner. 10. RRB’s were established on the recommendations of _________. 2. Which of the following terms indicates a mechanism used by commercial banks for providing credit to the government? 3. In the opinion of the Governor of Reserve Bank of India, which one of the following is the reason owing to which India’s inflation is accelerating ? A. Excess liquidity in market. 8. The idea of Lokpal has emanated from the office of Ombudsman, which is prevalant in ______ countries ? 10. The National Rural Livelihood Mission (NRLM) was launched recently. Which of the following statement is/are correct regarding NRLM ? (A) NRLM seeks to bring the rural poor under the self help group (SHG) network. 1. The rate of interest on term deposits in banks is stipulated by which of the following ? 4. Which of the following is/are the depositories in India handling dematerialized shares ? 5. What is the total number of stock exchanges in India ? 10. The Rajiv Gandhi Action plan, put forwarded in 1988 is related to which among the following?